I have some severe issues with my GTA 4 (1.0.8.0) and getting Reshade to run with it. First I've tried the old SweetFX 1.5.1 and ReShade 2.0.3/SweetFX 2.0 but both had the same issue. As soon as the game loads up, the screen starts to flicker and it looks like the injector tries to activate the effects multiple times (very rapidly). With the recent Reshade 3.2.2 everything works fine until I try to enable an effect in the menu. The game also starts to flicker and stutter in the same way. Does anyone here have the same issue or knows a possible solution? I would be very grateful. Last Edit: 11 months 2 weeks ago by Bad Actor. Try launching it through steam, end enable steam overlay fps display. Steam overlay with fps counter fixes similar reshade issues i have. I only own the retail/CD version of the game. Me too! Add it to steam as non steam game. I have but I couldn't find a way to enable the overlay for non-steam games. 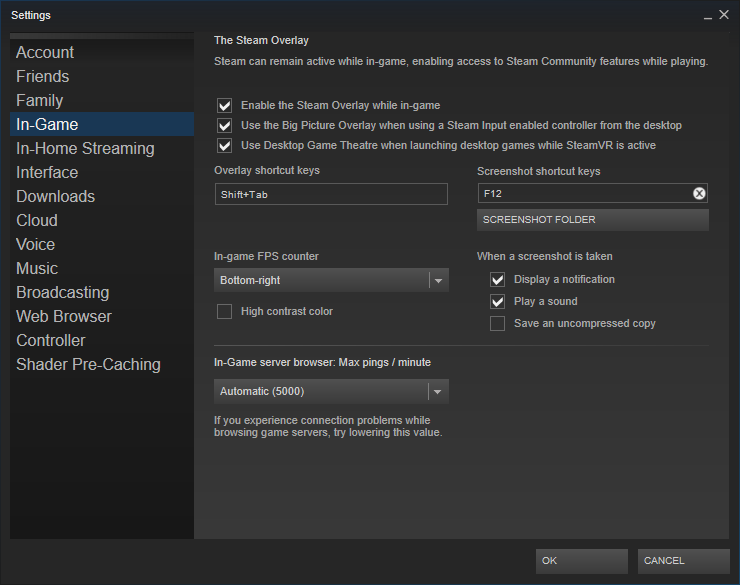 Check here; Steam - Settings and look under In-Game category. Mark everything like in my scrn. Last Edit: 11 months 2 weeks ago by Androll. I know how to enable the overlay but it just doesn't work with non-steam games. Did you mean that overlay fails with all added non-steam games? If so, try to diagnose because you can have some more deeper problems with your OS than Reshade alone. Disable other overlays, fps measurement tools, fraps, afterburner, reshade etc. Purge and reinstall gfx drivers using DDU www.guru3d.com/files-details/display-dri...taller-download.html and try again. OR if you want simpler solution, just use some older gpu drivers. For me this worked too, but i'm an "update or don't use" type guy, so i sticked to overlay method. Last Edit: 11 months 1 week ago by Androll.